Disclosure: No one asked me to write this review nor was I compensated in any way - which is probably why I paired it with a cherry clafoutis recipe. I know, random, right? I had no intention of writing a post on my experience until a few lovely readers of mine emailed me about it after seeing photos on my social media pages. I was only happy to oblige. So, in saying that, all views, opinions, recommendations, and weight gain are all my own. Chicago. Such a magical city. It didn't take me long to see why everyone loves this city. In fact, I fell hard. Fast. I've wanted to go to Chicago since Ferris Bueller's Day Off hit cable TV. You know the infamous parade scene where Ferris sings in the middle of the street on that float? I mean, c'mon, who wouldn't want to rock out on a float in the middle of downtown USA? (And if it wasn't filmed in Chicago, PLEASE don't tell me it wasn't. You will shatter every childhood memory I possess and break my heart). What I love most about Chi-Town is the simple fact it's a foodie town. Folks from Chicago (Chicagoians? Chicagoans? Chicagoers? Sorry) clearly love their food, which is awesome, because I love my food. You see where I'm going with this? Game. Set. Match. Here are just a, *ahem*, few places I dragged my hubsy and I hit while we were in the windy city. I should mention - when I returned home, I had blisters on the bottom of my feet. The bottom. Poorly chosen shoes were to blame, but beauty over pain is the name of the game for this gal. We covered A LOT of ground in three days, so keep that in mind as one will do a lotta walking if one wants to see the best of what the city has to offer. Again, these are all my own opinions. Disagree if you must, but you'll be fighting a battle with 10,000 suped up taste buds, two very observant brown eyes, and one hell of an overactive stomach - all of which are very, very stubborn. It's completely your call, love. Best Deep Dish Pizza - Giordano's. I'm sure there are going to be people that will emphatically disagree with me on this, but I truly believe the best pizza is here. I've had the fortunate opportunity to enjoy Lou's, Uno, Gino's AND Giordano's pizza (ironically all eaten outside of Chicago) and while they're all very good, Giordano's pizza wins hands down for me. Every time. There's something about the cheese, the crust, the sauce...*gurgle*. So fa-reaking good. What to expect: Be prepared to pay double what you would for an average pizza pie and wait up to an hour and 20 minutes before you actually eat, perhaps longer if you hit the more touristy area or go on a weekend. We went to the North Rush Street location and the place was heaving with a queue out the door and into the street. What to Order: The Special. Period. Best Breakfast - Yolk. If you find yourself in the River North area between 6am-3pm (7am on the weekends), head over to Yolk on North Wells Street. I implore you. What to expect: There will be a wait, especially on the weekend. Give your name to the hostess and request to sit at the counter, in eye shot to the cook's station. Not only will you be fed the best breakfast in the city, or possibly ever, you will have front row seats to the most well-oiled staff I've ever seen - and I worked in some pretty impressive restaurants. The staff bangs out gorgeous breakfasts like no one's business. What to Order: The Eggs Benedict, Corned Beef Hash and Eggs (or if you're more in the mood for more of a desserty breakfast, order the Red Velvet French Toast) sit back and enjoy the show. Best Sandwiches - Portillo's and Potbelly. Portillo's on West Ontario Street is a really fun establishment. It's not a swanky place by any means, but the food makes up for it tenfold. What to expect: Lines move fast, but it's a very busy place. Order at the counter, wait to be called, pick up food, and find a seat. What to Order: The Italian Beef Sandwich. This sandwich is incredible. It's Chicago's answer to the Philly Cheesesteak, if you will. (I'm originally from Pennsylvania and we take our cheesesteaks very seriously). The sandwich is served with sautéed peppers (hot or sweet) and a side of au jus, which is just a fancy pants word for roast beef drippings. You can also ask for a double dipped where they dip the entire sandwich in the drippings. I know. I've also heard of this magical chocolate cake they sell, but didn't get a chance to snap a slice. It's on my list the next time we head to the windy city. If you have snagged this cake, I'd love to hear your thoughts on it. Potbelly is a great sandwich shop that is along the lines of a Quizno's, but so not, if that makes any sense. The meats they use are out of this world and I would be hard pressed to find someone that didn't agree. There are about 10 of these shops located throughout the city. If you find one, head in. What to Order: The 'Roast Beef' on white with mustard. By all means, have the lettuce, tomatoes, onions, or whatever other salad ingredient you fancy on a sandwich, but I found I was picking all that off just to get to the meat, cheese, and mustard. If you want something a bit more hearty, get the 'A Wreck' with a splash of the Potbelly Vinaigrette. The flavour of the meats and cheese, married with the crusty bun...Dios Mio. Simply gorgeous. Be sure to grab a chocolate brownie cookie as well as an oatmeal raisin at the till. You'll thank me. Best Snack - Garrett Popcorn. Obvi. I'd never heard of Garrett Popcorn until we were in the planning stages of this trip. (I know, *GASP*) Suddenly, the name was ev-er-y-where. What you need to know: If you find yourself at the Garrett's at Navy Pier, be prepared to wait in line a looooong while. I'm not sure if they're all like that, but this one is crazy busy. Also, if you order a tin of popcorn, they'll seal it then and there to keep it fresh. What to Order: The Chicago Mix. When in Rome and the whole bit. The Chicago Mix is a half CaramelCrisp (caramel corn) and half CheeseCorn (cheddar) popcorn mix. It's pretty special. I did sample each on their own, and I have to say, the CheeseCorn can hold its own quite nicely. In fact, it's some of the best cheddar popcorn I've ever had - probably due to the face they make it fresh daily. I also sampled their Pecan, Almond, and Cashew CaramelCrisp, and while they were all delish, the cashew was my favourite. Doughnuts - I can't specify the best doughnuts in the city as I only had one, but if you do have a hankering for them, hit up the Doughnut Vault. Trust me. What to Expect: It's cash only basis. Get there early and expect a line out the door even if you do. Just know that once the doughnuts are gone, that's it for the day. It's small, it's blue, it looks like a vault, but the doughnuts make up for any shortcomings. What to Order: The Gingerbread Stack. Do it. Ice Cream - If you're the ice cream sort (and who isn't?) be sure to hit up Ghirardelli's on Magnificent Mile. It's a bit cliche, I know, but it's amazing. What to expect: The desserts are pricey and it gets quite busy, but it's definitely worth your time and money. It's a bit cliche to hit a spot like this, I know, but it's amazing. I mean, it's Ghirardelli chocolate...c'mon! Plus you score one of their famous chocolate squares just for walking through the door. What to order: Whatever you order, get the dark chocolate fudge on it. It's an extra cost, but whoa. WHOA. Shocking enough, we didn't hit any ballparks. I know, right? Big baseball family with the biggest baseball fan on the planet and we didn't hit any games. Because this was our first visit to Chicago, but certainly not our last, we wanted to experience the downtown core as much as possible. River Tour - The First Lady Architecture River Tour to be exact. (There are several other water tours, but this is the creme de la river tour creme). This tour was recommended to us by a dear friend and it's nothing short of spectacular. I LOVE architecture and Chicago has some most INCREDIBLE buildings I've ever seen with some amazing stories behind them on how they came to be. This is the best way to see them in full. It's a 90 minute boat ride through the city and all the tour guides are volunteers - and they know their stuff. What to expect: It was quite cold on the boat, even in mid-July, so you may want to bring a light jacket just in case. Millennium Park. Millennium Park is a beautiful park to stroll through as a whole, but the big silver bean over in Cloud Gate? Yeah, that's super neato. Worth visiting for shiza. Navy Pier - I gotta say, this one was a bit of a disappointment for me. I don't know what I was expecting, but it's not that. It reminds me of a boardwalk you'd find at most beaches along the shoreline. There's rides, some souvy shops, huge crowds, the youzhe. It's not my kind of scene, although I am glad I went to see what all the fuss was about. Magnificent Mile. Shop after shop after shop after glorious shop. It's called Magnificent Mile for a reason people. It's magnificent. 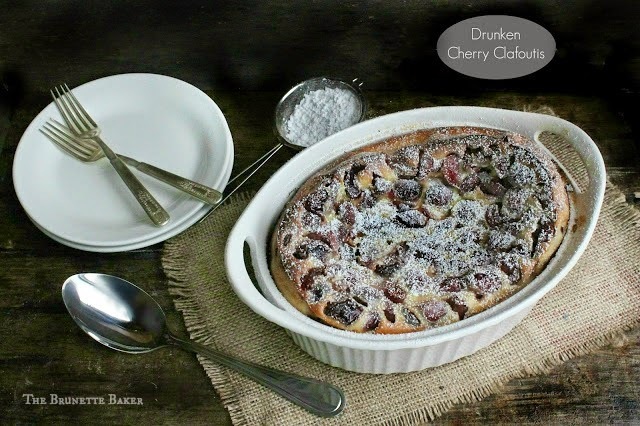 Just as this cherry clafoutis is. It's sweet, but not too sweet, it's rich and it's drunk. Sounds like a certain reality TV show I like to watch, but thankfully, this dish is much more digestible. Note: It's important you use a ceramic or glass dish with this recipe. Stoneware will cause the clafoutis to bake longer and deflate quite quickly and more than it should due to its heat retaining properties. Place cherries and Amaretto/Bourbon in a glass bowl to soak. After about an hour or so, place cherries in a sieve and completely drain off liqueur. Place cherries onto a paper towel to rest. *You can forgo the alcohol entirely if you wish. The dish is quite delicious with or without it. Preheat oven to 375ºF. Prepare a 8 to 10-inch baking dish by generously coating the bottom and sides with butter. Place cherries to dish; set aside. In a mixing bowl, whisk eggs, sugar, and salt together until incorporated. Whisk in flour. Slowly whisk in milk, heavy cream, and vanilla extract until creamy and smooth. Pour egg mixture over cherries. Bake for 40-50 minutes or until lightly golden or a toothpick inserted comes out clean. Clafoutis will be quite puffy once removed from the oven, but will deflate slightly as it cools. Once cooled, dust with powdered sugar. Enjoy. First off, you had me at drunken!! You had a great time in Chicago. I love that city. I've been twice but I am ashamed to say I have not seen anything outside of the magnificent mile...so many shops that it always takes me two days to complete them all! Been thinking of making a clafoutis again for a few weeks now, need to get on with it after seeing this! Wow you did some serious eating in Chicago - sounds like my dream holiday! Oh Lord. I always wanted to go there, and no I must. Great roundup! Also, that movie is the best best best. Do you think this would also taste good using a sweet red wine in place of the amaretto? I have some I need to get rid of and thought this might be just the place to use it. I'm glad you liked Chicago. I've lived here most of my life. I liked your suggestions! I've never been to Yolk so I'll have to give it a try. The architectural river tour is wonderful and there's one that goes up the river and then for a ride in Lake Michigan for a little while. You get to see the skyline from a unique view! You also go through the locks going out and returning to the river. They're at different heights. as well as a children's museum. I hope you come back for another visit. It's a beautiful city in every season.